The telephone rings. Nurse Judy Price answers, "Dr. Christian's office..." So begins another episode of one of best-loved radio dramas of all time. Dr. Paul Christian's adventures were showcased for 15 years on The Vaseline Program, "the only show in radio where the audience writes the script." Each week's script was selected from the thousands sent in by listeners, who were then eligible for big cash prizes at the end of each season. 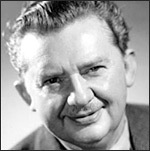 Journey to River's End for six classic episodes starring Jean Hersholt as Dr. Christian. He dispenses a healthy dose of kindness, sympathy, and understanding in his small town practice. Rosemary DeCamp co-stars as Nurse Price, with Art Gilmore as the announcer.